What’s a birthday dinner without birthday cake? There has to be cake. And after polling Craig on his preferred dinner option (the aforementioned birthday lasagna), I queried him about cake. 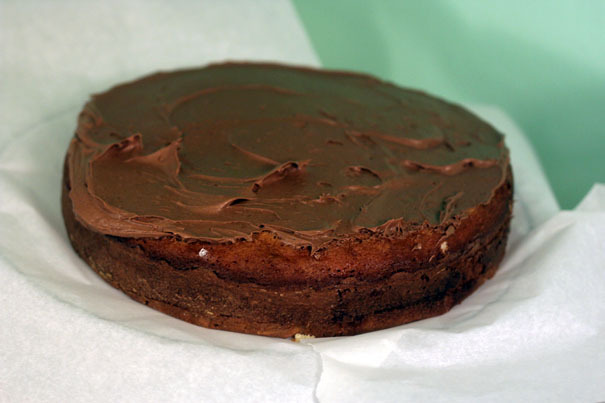 His response: “Yellow cake with chocolate frosting, please.” That’s when a hyperlink appeared in my brain sending me to this cake recipe from Smitten Kitchen. That’s your yellow cake. 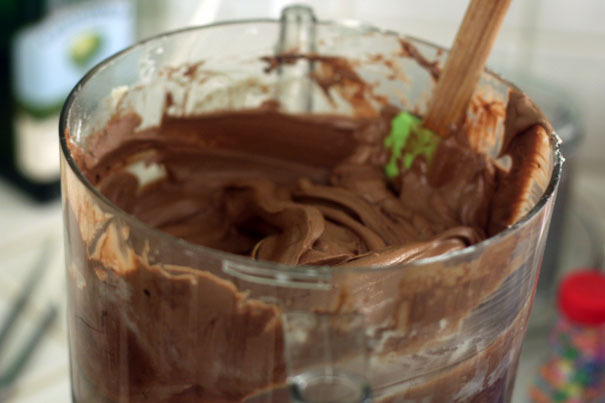 Now if you followed that link to Smitten Kitchen, you’ll see she does a kind of sour cream chocolate frosting; that looked good but she warns that it’s indeed sour so I decided to go a more conventional route and follow her recipe for Instant Fudge Frosting. 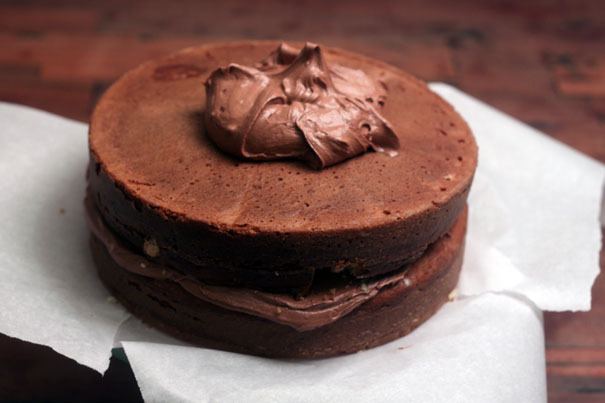 The amazing thing about this recipe is that it comes together in a food processor. 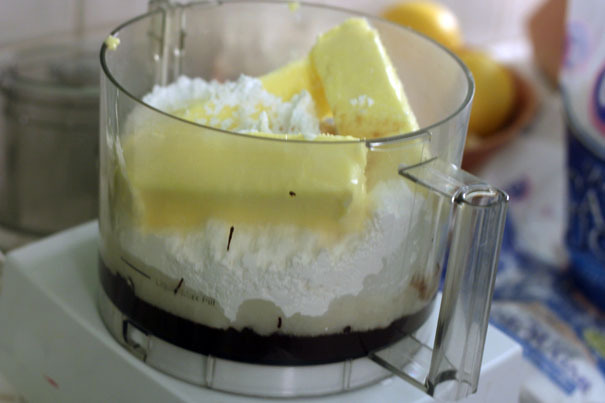 It’s as simple as this: in a food processor, you add 6 ounces of melted unsweetened chocolate (melt in a double boiler and then let cool for a bit), 4 1/2 cups unsifted confectioners’ sugar, 3 sticks of butter at room temperature (and make sure it’s room temperature or it won’t work as well), 6 tablespoons half-and-half or whole milk and 1 tablespoon of vanilla extract. 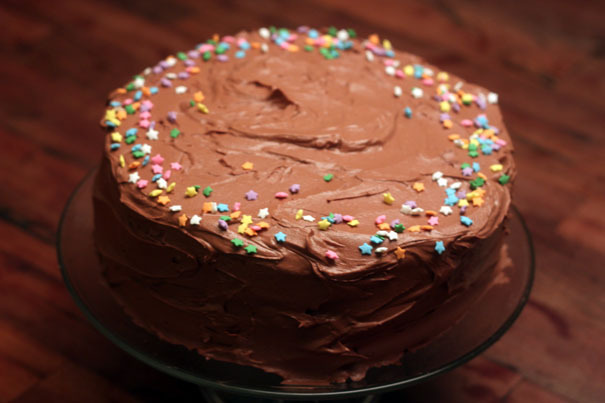 As for frosting the cake, hopefully you’ve let your cake cool for a few hours–frosting a warm cake is a bad idea. And notice the cake is sitting on strips of parchment paper, that’s important because when you frost the exterior of the cake you’d normally get globs of frosting on the cake stand. With the parchment, you can pull those away to reveal a pretty cake. 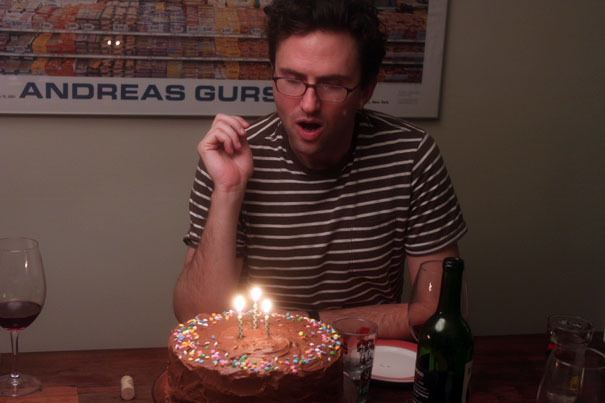 Actually everyone looks forlorn… maybe because the cake is bringing back birthday memories from childhood? 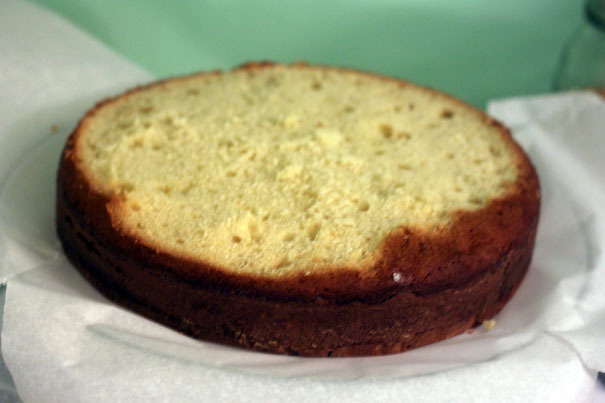 In any case, thanks Deb for a superior yellow cake recipe. I can’t wait to make it again. 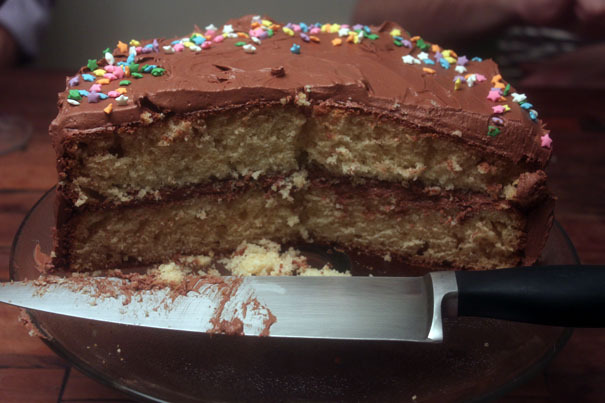 Summary: Based on the Best Birthday Cake from Smitten Kitchen. Now prep two 9-inch cake pans. Here’s how I do it: spray the pans with Pam, then cut parchment circles using this neat trick—cut a large square of parchment and then fold it corner to corner so it’s a triangle. Then fold the triangle in half again and then again and again until you have a narrow pointy triangle. Hold the point of the triangle over the center of your cake pan and cut it where it reaches the interior wall of the cake pan. Unfold the parchment and you should have a circle. (Otherwise just cut a circle any way you like.) Lay a circle of parchment into each cake pan, spray again with Pam and then spoon in some flour into the first pan. 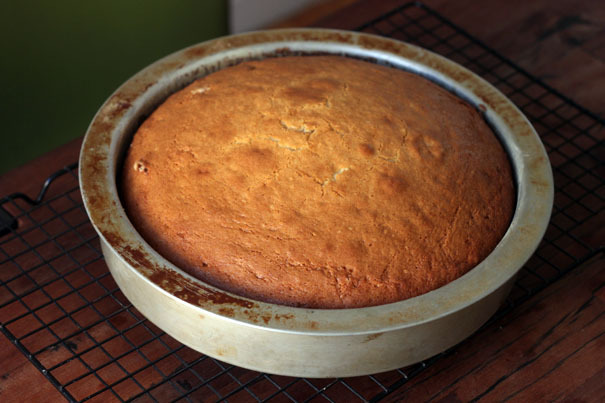 Holding it over the other cake pan, move the pan in circles so it gets coated in flour and so that excess flour falls into the second cake pan. 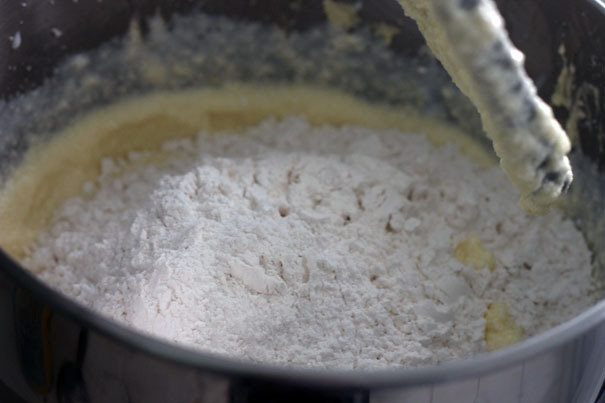 Now coat the second cake pan with flour, discarding excess in the sink or the trash. That’s how you coat cake pans. 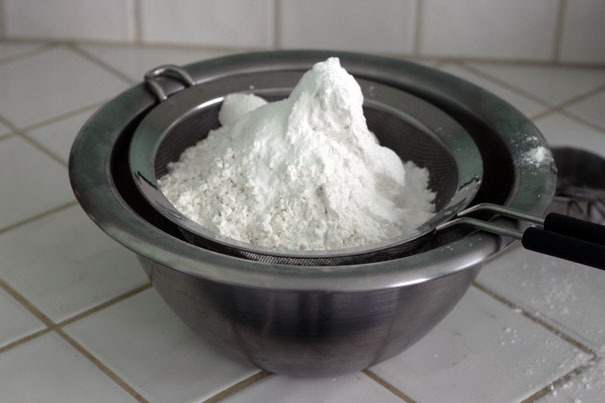 Sift together your dry ingredients: the flour, the baking powder, the baking soda, and salt into a large bowl. 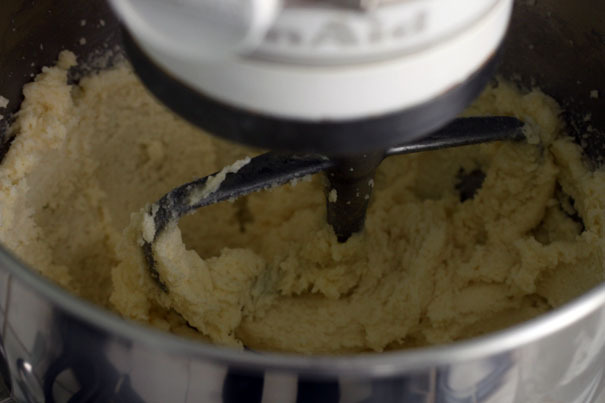 In a stand mixer, beat together the butter and sugar on medium speed until pale and fluffy. Add the vanilla and then the eggs, one at a time, scraping down the bowl after each addition. At low speed, add the buttermilk (the mixture may look curdled). Finally add the flour mixture in three batches mixing just until it’s incorporated. 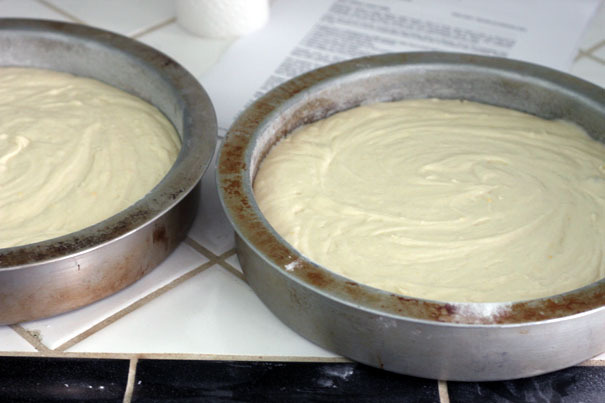 Divide the batter evenly between the two cake pans. Bang each pan on the counter to get rid of any air bubbles and then bake for 35 to 40 minutes until a toothpick (or a knife) comes out clean when you place it in the center of each cake. Cool on a rack for 10 minutes then run a knife around each cake, turn it upside down and remove the pan and the parchment. Allow to cool like this for a few hours before frosting as detailed in the blog post above. 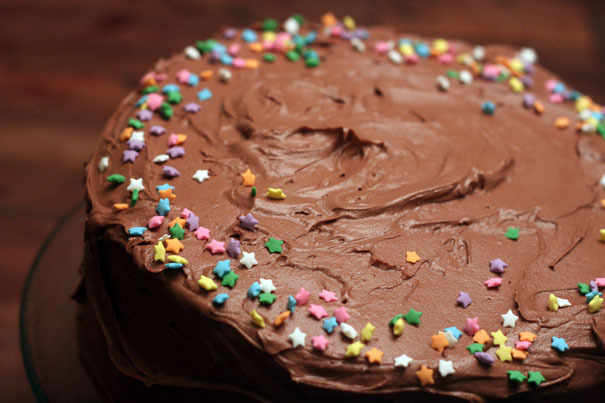 Decorate as you wish and, if you’re eating it the same day, store at room temperature on a cake stand with a lid, if possible. 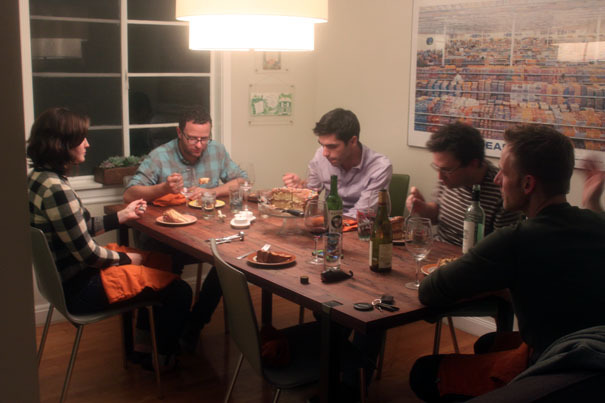 If you want it for another day, refrigerate and bring back to room temperature before eating.